Interested in hosting this exhibit? More information HERE. 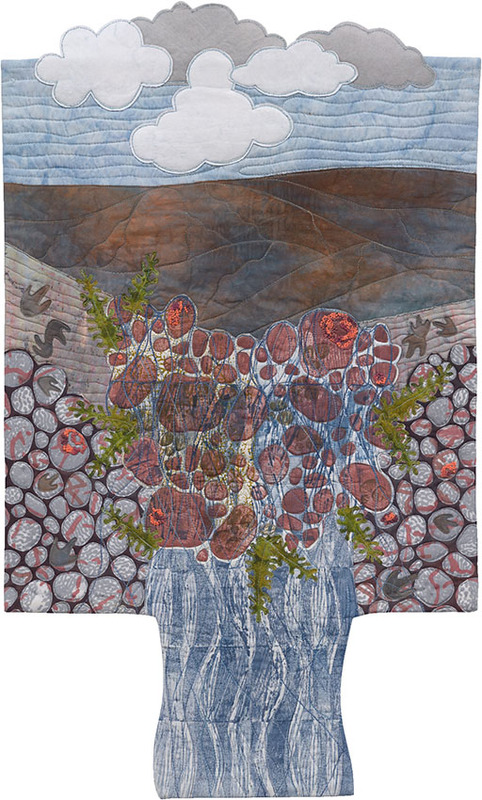 DENALI: Artists Respond to Music Inspired by Wilderness was conceived at the confluence of two languages— music and visual art. Elements Artist Group, six artists anchored in Alaska, created eighteen pieces of art in collaboration with nine composers from Composing in the Wilderness 2017. Each piece of art is a personal response to a musical composition. 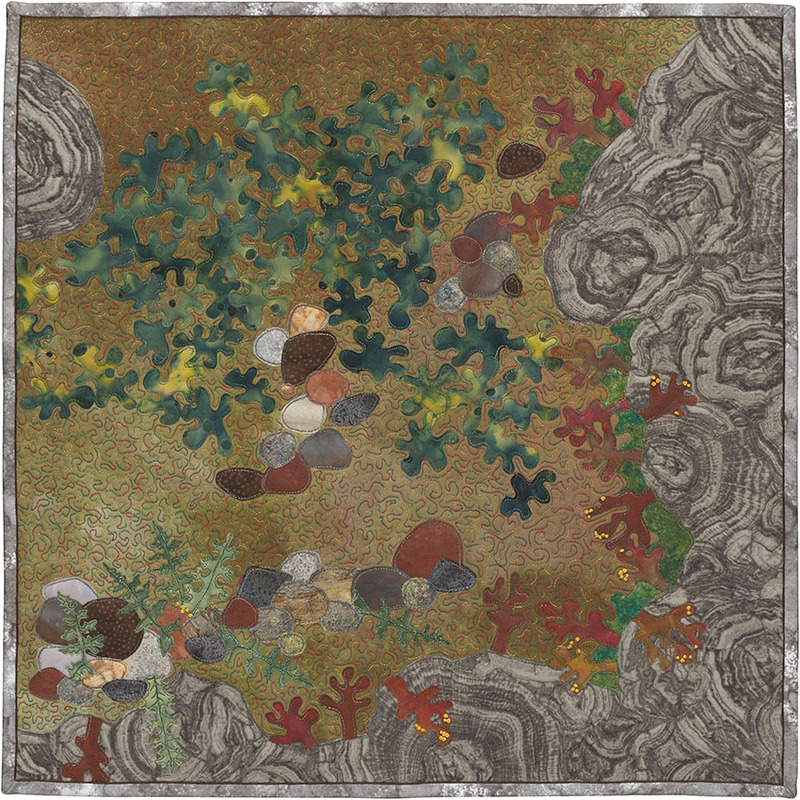 The idea for the project was sparked in 2012 by a painting Elements artist Mary Bee Kaufman rendered while listening to music written by Christina Rusnak. 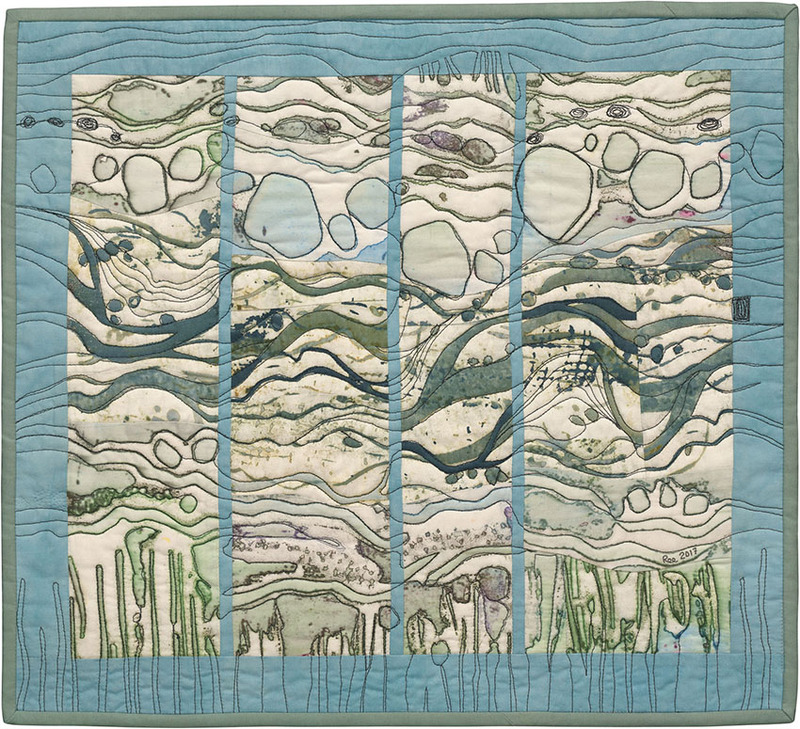 Their successful collaboration resonated with fellow Elements artists who were eager to explore a new challenge— making art in response to music inspired by a place they love, Denali National Park. Stephen Lias, Composing in the Wilderness Director, shared the proposal with his musicians and they enthusiastically said, “Yes!” Generous support of a Community Arts Development Grant from the Alaska State Council on the Arts helped fund the project. Composers shared their music, scores, ideas, and information about specific locations that kindled their inspiration. Elements artists have all experienced the transformative potency of living, working, traveling, or being an Artist in Residence in Denali Park. They have personal knowledge of its unique landscape, flora and fauna, weather and soundscapes. 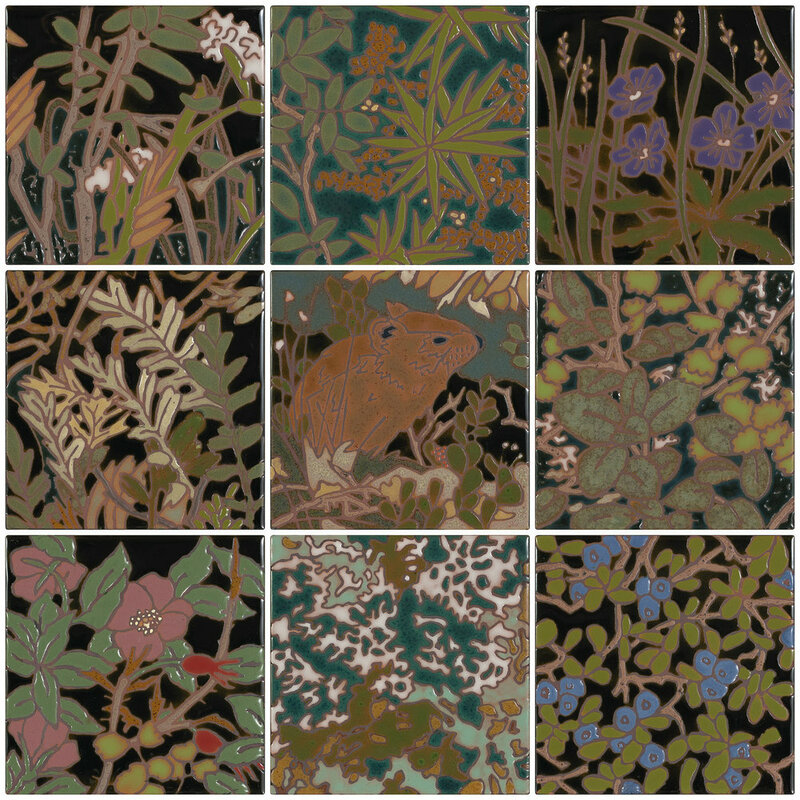 Their connections to this rare wilderness, along with knowledge of specific places influenced their responses— the colors, textures, shapes, and images they chose. The composers and artist meet for the first time in a back room at the Denali Visitors Center. Each artist responded to three pieces of music, generating eighteen works of art— two responses to each of the nine musical compositions. Artists worked in a variety of media including fiber, ceramic tiles, painting, poetry, traditional and nontraditional bookmaking materials. 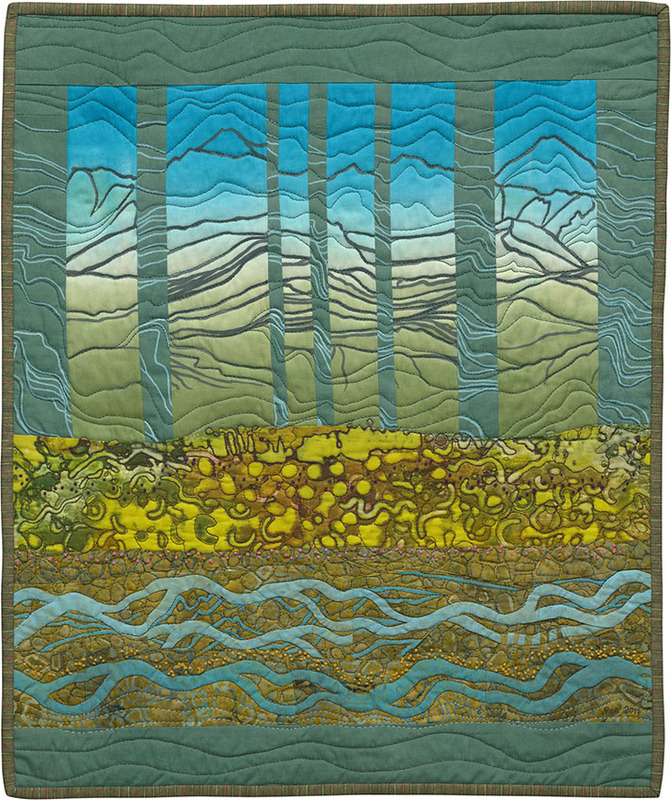 Meeting regularly to exchange ideas, Elements members have been committed to each other’s creative growth since 2003 when a dozen fiber artists formed the original Elements Group. Over the years, the group evolved to include artists working in an array of media. 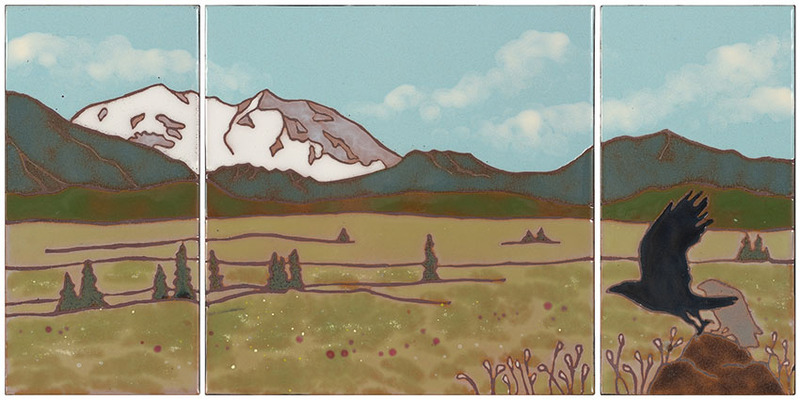 Each has exhibited her work in a wide variety of solo and group shows in Alaska and the Lower 48. Public museums and private collections house their work and each artist has been honored with awards and commissions. They relish the convergence of fresh astonishment and seasoned expertise, a pivotal reason why this collaboration has been a rich, gratifying experience. COMPOSING IN THE WILDERNESS is a life-changing field course offered annually by the Fairbanks Summer Arts Festival in collaboration with Alaska Geographic and the National Park Service. Led by adventurer-composer Stephen Lias, these composers were taken into the backcountry of Denali National Park for four days for an intense and immersive creative adventure. Through many hikes and interactions with scientists, naturalists, and wilderness guides, the composers developed an intimate knowledge of this pristine Alaskan wilderness. With this as their inspiration, the group was then flown to the remote Coal Creek Camp in Yukon-Charley Rivers National Preserve where they had four days to compose original works for chamber ensemble. Upon returning to Fairbanks, these works were then rehearsed and performed for audiences in both Denali and Fairbanks. Drawing on experts in every discipline, the FAIRBANKS SUMMER ARTS FESTIVAL brings together musicians, chefs, dancers, actors, photographers, and artists of all types for two intense weeks in July. Each year they enlist accomplished instrumental performers to create a dynamic chamber ensemble (CORVUS) which presents concerts in Fairbanks, as well as outreach events in rural communities of interior Alaska. In 2017, Corvus was comprised of Katie Cox (flute), Mara Mayer (clarinet), Andie Springer (violin), Charly Akert (cello), and Joe Bergen (percussion).